LA.B Film & Content, a global production company, specializes in producing commercials and branded content for Fortune 500 companies. 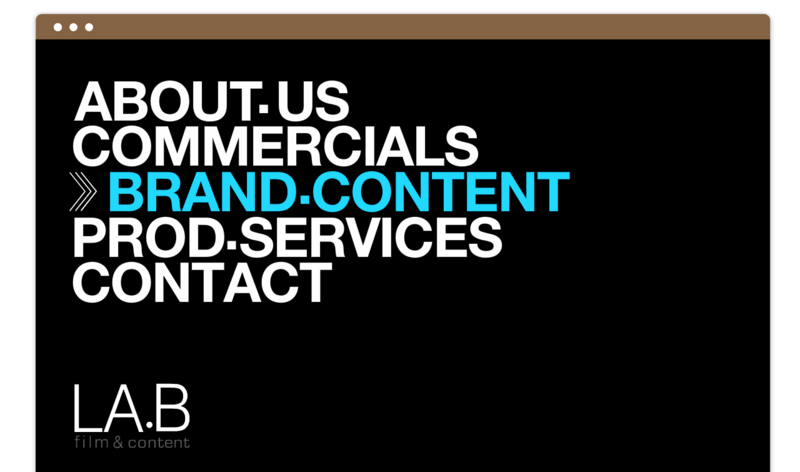 An outgrowth of veteran COGNITO FILMS, LA.B was launched in 2009 to meet the demands of the changing market and to bring a new sensibility to American advertising through a unique roster of top-notch international and domestic talent. LA.B’s roster of directors and talented production staff bring a new perspective to the industry, one that recognizes the shift from brands that do business to the business of branding. “We understand that the business of advertising isn’t about the product, but about a connection between people,” states Alan Landau, the award-winning executive producer and founder of LA.B Film & Content. Combining years of experience with creativity and solid production values, the LA.B team builds unique content that makes their productions and clients stand out. Whether working on a television commercial, a film, a music video, or corporate promotional material, LA.B has assembled the talent to handle branding and marketing in a variety of media applications to meet the needs of an increasingly diverse, vibrant and global client-base.